Don't forget to stop by McKenzie's blog, this week's host, to see her take on the recipe, as well as what all the other Barefooters did. Place the chicken breasts on a sheet pan and rub with the skin with olive oil. Sprinkle liberally with salt and pepper. Roast for 20 to 25 minutes, until the chicken is just cooked. Set aside until cool enough to handle. Cut the chicken into large bite-sized pieces. Blanch the asparagus in a pot of boiling salted water for 3 to 5 minutes until crisp-tender. Plunge into ice water to stop the cooking. Drain. Cut the peppers in strips about the size of the asparagus pieces. 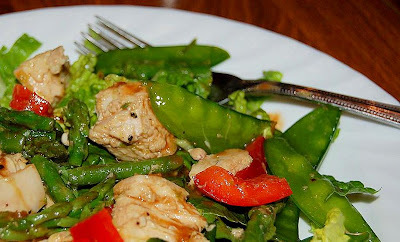 Combine the cut chicken, asparagus, peas, and peppers in a large bowl. Beautiful! I so wanted snow peas in mine but they didn't look so hot at the store. I took out the bulk of the sodium / salt and a lot of the fat too, (and like you, was happy there was no butter to remove!). Great job! I like the pea addition! Ohhh the peas llok fab! Nice job! What a brilliant addition the sweet peas are. Love this with peas - so perfect for an Asian-inspired dish! So glad that you all enjoyed this. And I'm glad that you had a good trip! I loved this recipe, and love that you added the snow peas, will try that next time! Beautiful salad! Oh I LOVE the peas! Wish I'd thought of that... not that the salad needed any more crunch. Oh I love that there are snap peas in it! I love snap peas. FYI- I am hosting a giveaway for a super cute top! Wow, talk about experiences the weather extremes! I'm glad you're back in warm AZ. It's been so nice in N.Cal., but today, it's rainy and COLD. Maybe some of your warm weather will blow this way! Your Chinese chicken looks totally delicious! I love meals that can be thrown together with whatever you have on hand. Great way to use up veggies! Snow Peas! Mojo would have enjoyed them!!! Yours looks wonderful....cheers! Ooh, the lime sounds good. I always have to add bread to Jeff's meals, too, or some sort of carb. Must be something in that Y chromosome. The rotisserie chicken is a great idea if you are in a hurry. This was a great recipe. Yours looks yummy. This was a yummy recipe, and yes, you could easily substitute other veggies! Mmmm, you reminded me of the CC salad my mom use to make: iceberg lettuce, chicken, dressing and these super-thin Asian noodles you have to fry up...heavenly! This one's a little classier...and healthier. This looks delicious, Anne. I think the squeeze of lime is just what this needs: a little more acid. I am discovering the joy of cooking amongst my baby boy and husband like you! Thank you for the delicious brownie pudding recipe that is sure to be a hit! I love your blog and humor! I am for sure adding this to mine. I sure would appreciate it if you would add mine to yours! Thank you Anne! It was lovely - we will be making this one again and again. loved this one! next time i'll add snow peas.